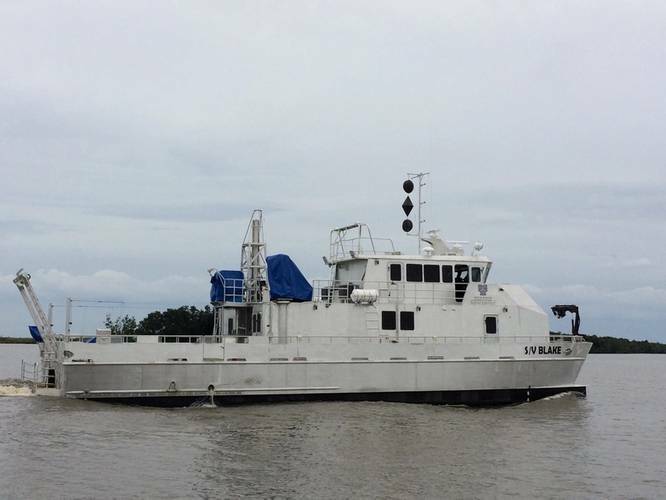 David Evans and Associates, Inc.’s Marine Services Division commissioned its new 82-foot hydrographic survey and scientific vessel Blake in a ceremony held in the vessel’s homeport of Gulfport, Mississippi. At the ceremony, U.S. Senator Thad Cochran of Mississippi broke a Champagne bottle across the Blake’s bow. In addition to remarks by the Senator, Rear Admiral Gerd Glang, the director of the National Oceanic and Atmospheric Administration’s Office of Coast Survey and the U.S. National Hydrographer, and Mayor of Gulfport William Gardner Hewes spoke to attendees. 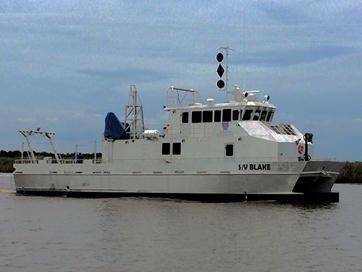 The custom-built Blake is a Coast Guard-certified, aluminum catamaran designed to be a stable, efficient and cost-effective survey platform with wave-piercing bows, Tier-3 diesel engines, twin 50-kilowatt generators and a full suite of state-of-the-art survey instrumentation. Built by Geo Shipyard in New Iberia, Louisiana, the vessel will complement the firm’s national operations and expand DEA’s hydrographic and geophysical survey and marine science capabilities in the Gulf of Mexico and beyond. She will start her career with a crew of 10, performing charting surveys of Gulfport Channel and Chandeleur Sound, with 24-hour survey operations and port calls every 10 days. The vessel is named after the 19th century Coast and Geodetic Survey Steamer Blake, an oceanographic and hydrographic vessel renowned for testing innovative technologies such as the Pilsbury current meter which was the first deep sea current meter and the Sigbee deep sea sounding machine. The original Blake was commissioned in 1874, operated in the Gulf of Maine, the Gulf of Mexico, and the Caribbean Sea. The Blake’s accomplishments are documented in Three Cruises of the BLAKE by Alexander Agassiz. The vessel has numerous seafloor features named after her, including the Blake Abyssal Plain, Blake Plateau, Blake Canyon and Blake Ridge, all of which are off the southeastern coast of the U.S.
European shipbuilders have announced a new cooperative initiative to develop and demonstrate a connected vessel platform.